Such a beautiful lush summertime pic, right? Not Bunky, but looks like it could be. I know it’s not the end of summer yet, but I’m already starting to feel the heaviness of fall as it lumbers closer. The encroaching darkness, the end of summer rot, and I’m not talking about the stench of trash in our Brooklyn neighborhood. Gardens have reached their peak and are starting their inevitable slide down. There’s an overripeness to late summer, almost obscene in its abundance, and yet the edges of flower petals are starting to fray, the first leaves are beginning to fall. I am a sucker for spring, for beginnings, for budding trees, and the hopeful yellow of daffodils. Don’t get me wrong, I love summer. LOVE it. But, spring wins for me because of its glorious contrast to winter, and because it means summer is coming. I should probably just live in the moment more, but it’s not really my style. Am I over thinking this or what? But I can’t help myself. I always get a little down as September approaches, a habit from being a kid, and now probably because I have one about to start kindergarden. She looks ready, right? Right? I have very mixed feelings about the impending start of school. Part of me is looking forward to a break from Bunky’s endless refrain, often spoken in a whine on repeat, “play with me” and a little excited to have some one on one time with Little Guy, who usually just gets dragged along to big kid playdates, big kid playgrounds. Not that he minds so much… Okay, let’s face facts, it will be way easier having one kid at a time. But – but (!) when Bunky went off to her brief sojourn to camp last week, I totally teared up. I’m such a sucker, I know. The truth is, this summer has gone by in a flash and wasn’t nearly as challenging as I had feared. Thanks in big part to our wonderful trips to the country house and to my dad’s beachside home, not to mention my husband’s flexible real estate schedule. I’m just not quite ready to dive into the chaos and exhaustion of school. Scrambling to make lunch and snack every day by 8am, worrying about conflicting nap and pick-up schedules, and dealing with ALL the tiresome but necessary GF food wrangling I will have to manage. But the clock rolls on despite my anxiety, and maybe – here’s hoping – that the school year will prove smoother than I am anticipating. Kinda like summer. Well, at least there is the whole buying new lunch box accessories to perk me up. Hello, retail therapy! We actually all had fun looking through the Planet Box website and selecting a new case for Bunky’s Rover (red rocket), a fresh set of magnets, and a mini version called the Shuttle for Little Guy. How cute is this?! 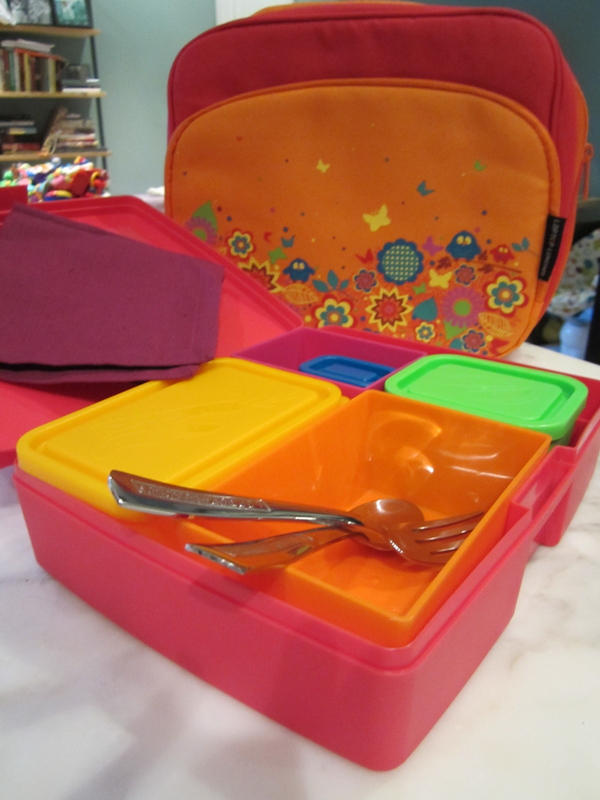 Perhaps you remember my slightly spastic lunch box post back in September? I manically photographed a week’s worth of lunches and described our two new purchases, Planet Box and Laptop Lunches. At the time I didn’t know which product would work best for my family. Both seemed pretty awesome. The main difference is that Planet Box system is one piece of stainless steel with compartments built in while Laptop Lunches has containers that go inside of a plastic lunch box. Ultra cute carry cases not included. Our Laptop Lunch box and case. Totally didn’t use the utensils. Or that napkin. Below is a pic of the Planet Box Rover. The circular canisters inside are called the Big and Little Dipper. Cute, right? They can be placed inside or outside in the carrying case pockets. Here is the Rover in action, Bunky’s Valentine’s Day lunch from last winter. Gotta love a pretty frosted cookie. Fortunately, the kid actually eats her veggies, too. Unfortunately, those are the only veggies she eats. Ha. 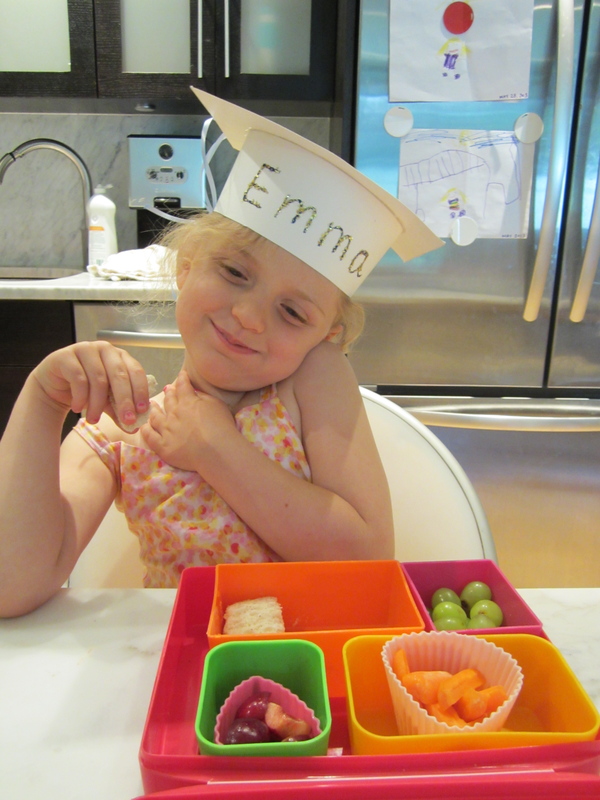 Check out my cute little pre-K graduate enjoying her Laptop Lunch at home. Ultimately, while we used and liked both products, the Planet Box Rover worked best for us. 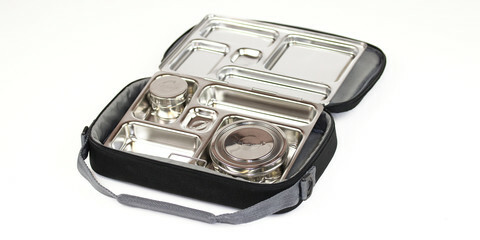 Laptop Lunches has a great bento system – and both are dishwasher safe (yay!) – but ultimately the plastic one was harder for my kid to open. Which is kind of a deal breaker, especially for kindergarten where B will be eating in a busy cafeteria (gulp) with minimal teacher assistance. So here we are, three weeks and counting to the first day of school. I can’t believe my baby is starting kindergarten. I mean, I remember when I started kindergarten. Geez, it’s so easy to feel old when you’re a parent. Every milestone reminds you of your own. I suppose it’s probably best for me to concentrate on things like lunch boxes and school letters so I don’t think too hard about how fast my little girl is growing up. 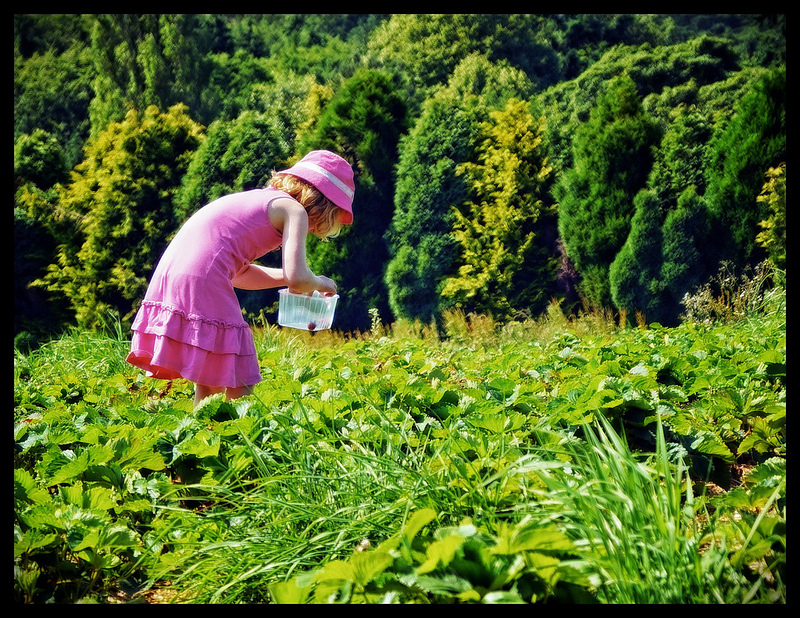 This entry was posted in Family, How-to's and tagged celiac, gluten free, kindergarten, lunch, planet box, school, summer by Dana. Bookmark the permalink. Pack as much of the lunch/snack the night before. Huge time saver in the morning! And it really goes too fast. 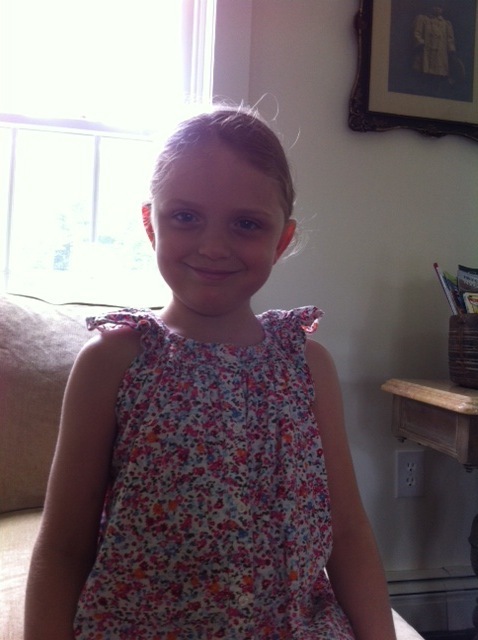 Meredith will be starting 2nd grade. Her celiac dx came 1 week before kindergarten started. Seems like yesterday. I love Spring too – that is a nifty lunch box! I think I’ll have to look into those. I sm a bit obsessed with Planet Box! It’s a bit pricey but it will last for years. I feel like we haven’t connected on here for a while (probably because we’ve both had internet “light” summers, right?) I just started to think about the school lunch situation this morning. 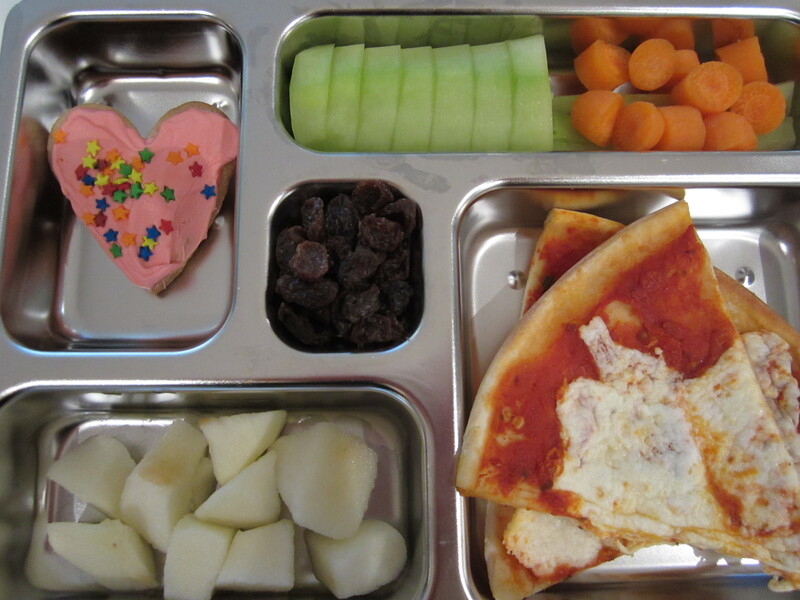 My oldest 2 will be in Kindergarten and 2nd grade, and it’s time for us to kick the lunches up a notch (and make them the night before so we can maintain some semblance of sanity in the morning rush every day!) I am going to check out the Planet Box series, the Rover looks like a good fit for us. Thank you. Also, have you came across any good pages for lunch ideas…we have really just flown by the seat of our pants for Grace the past 2 years. Also, I hope that Bunky’s 1st day of Kindergarten goes well! When does she start? Jess, hi! It’s great to hear from you 🙂 Yeah, light summers indeed! Kind of an oxymoron with kids as you well know. I definitely want to try to do more lunch prep work in the evenings if possible… I never got around it that last year and it showed in my morning stress levels. Planet Box is definitely awesome. We’re still eagerly awaiting our new products. As for good lunch ideas/sites, I have been pinning some links here and there on my For the Kiddos and GF Bento boards on Pinterest. But nothing major, you know? I’m always on the look for some brilliant insight, but when it comes down to it, my kid is picky and GF and there’s only so much she will eat, and I only have so much time/interest in going Bento-crazy. I have a bunch of cookie cutters and veggie cutters that help make what she WILL eat look better. Presentation is (apparently) key! I also bought these cute egg/rice molds that I plan on using more this year, and I want to order some mini kebob sticks to do veggie and cheese kebobs for sandwich alternatives. B starts K on Sept 9th, which looms even closer now! What about your kids? Cute lunchboxes! And what a great description of the end of summer…very evocative. I can even smell the trash (or maybe it’s just that my street actually does smell like trash). Ha! Thanks Molly. Yeah, the trash smell is definitely my least favorite thing about city summers. The end of summer slide! So true. Rotting everything everywhere. And despite the incessant rain where we are, our front lawn has literally turned to DUST. I’ve hacked through the overgrowth but now the front garden just looks like a clearcut! Rotting everything and dusty lawns are no fun. Bring on some pretty fall foliage or something at least! Hi Dana! I’m going to have to check out that lunchbox site. It looks amazing. My number one tip for packing a school lunchbox is to do as much as you can the night before. It saves time, stress and also reduces the risk of mixing up the gluten and gf food. All the best! Thanks for the tip Kate! I feel like if I can’t physically prep, then I mentally plan out the menu the night before so in the morning I’m not scrambling to think of what to pack. 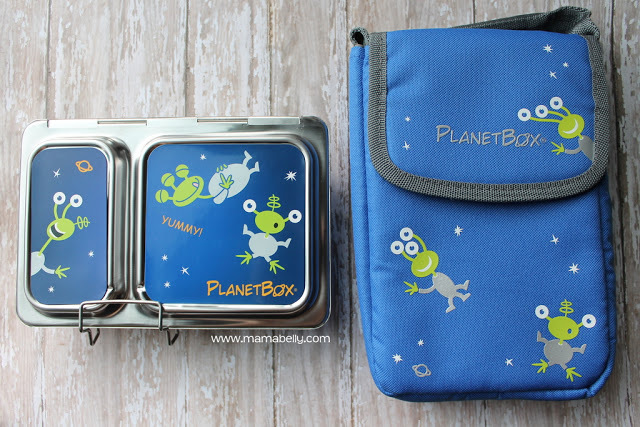 I can’t recommend those lunch boxes enough, especially Planet Box. It’s been awesome. Absolutely not over-thinking the whole decent into Autumn thing – I know exactly what you mean. With Spring just starting here I’m constantly in a good mood. It’s crazy how much it affects us. Yes, weather totally makes such a difference. I’m really trying to enjoy fall for what it is (as opposed to a foreboding preview to winter), but spring is definitely more my season 🙂 Enjoy it!